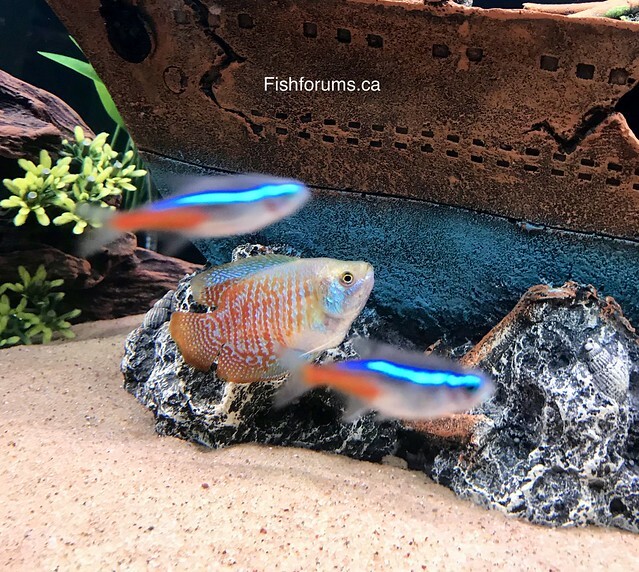 Here you can see our new turquoise dwarf gourami swimming with some neons in our 125 gallon aquarium. I beleive it is a male due to the more pointed dorsal fin, but I can't be sure. What I find particularly interesting about these fish is that they are labyrinth fish, meaning they have developed a lung and can breath air for relatively short periods of time. The labyrinth organ, a defining characteristic of fish in the suborder Anabantoidei, is a much-folded suprabranchial accessory breathing organ. It is formed by vascularized expansion of the epibranchial bone of the first gill arch and used for respiration in air. This organ allows labyrinth fish to take in oxygen directly from the air, instead of taking it from the water in which they reside through use of gills. The labyrinth organ helps the inhaled oxygen to be absorbed into the bloodstream. As a result, labyrinth fish can survive for a short period of time out of water, as they can inhale the air around them, provided they stay moist. All times are GMT-4. This page was generated at 09:18 PM.